This tutorial is going to show you how to install LEMP stack on RHEL 8 and CentOS 8. A software stack is a set of software tools bundled together. LEMP stands for Linux, Nginx (pronounced engine X), MariaDB/MySQL and PHP, all of which are open source. It is the most common software stack that powers dynamic websites and web applications. Linux is the operating system; Nginx is the web server; MariaDB/MySQL is the database server and PHP is the server-side scripting language responsible for generating dynamic web pages. You can download and install RHEL 8 by following the tutorial below. This tutorial uses root account to manage administration tasks. To switch to root, run the following command and enter root password. Nginx is a high performance web server and very popular these days. It also can be used as a reverse proxy and caching server. Enter this command to install Nginx Web server. Enable Nginx to auto start at system boot time by running the following command. “Enabled” indicates that auto start at boot time is enabled and we can see that Nginx is running. Notice that the above command will not immediately quit after running. You need to press “q” to make it quit. If you are installing LEMP on your local RHEL 8/CentOS 8 computer, then type 127.0.0.1 or localhost in the browser address bar. You should see the “Welcome to Nginx” Web page, which means Nginx Web server is running properly. By default, RHEL 8/CentOS 8 forbids public access to port 80. To allow other computers to access the web page, we need to open port 80 in firewalld, the dynamic firewall manager on RHEL/CentOS. Run the following command to open port 80. If you want to enable HTTPS on Nginx later, then you also need to open port 443. The --permanent option will make this firewall rule persistent across system reboots. Next, reload the firewall daemon for the change to take effect. Now the Nginx web page is accessible publicly. Finally, we need to make user nginx as the owner of web directory. By default it’s owned by the root user. MariaDB is a drop-in replacement for MySQL. It is developed by former members of MySQL team who are concerned that Oracle might turn MySQL into a closed-source product. Enter the following command to install MariaDB on RHEL 8/CentOS 8. After it’s installed, we need to start it. Enable auto start at system boot time. “Enabled” indicates that auto start at boot time is enabled and we can see that MariaDB server is running. Now we need to run the security script. When it asks you to enter MariaDB root password, press Enter key as the root password isn’t set yet. Then enter y to set the root password for MariaDB server. 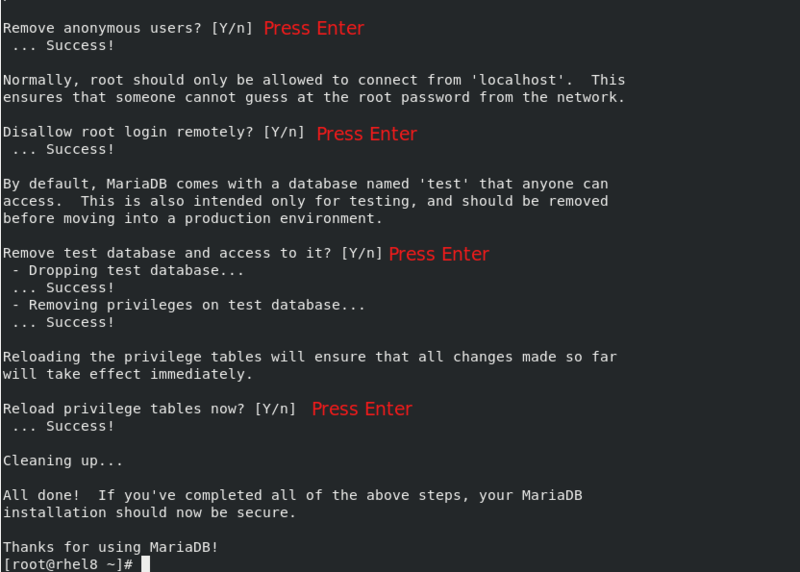 Now you can run the following command and enter MariaDB root password to log into MariaDB shell. Status: "Processes active: 0, idle: 5, Requests: 0, slow: 0, Traffic: 0req/sec"
By default, PHP-FPM is run as the apache user. Since we are using Nginx web server, we need to change it. Find the following two lines. In this file you find the following line. This indicates that PHP-FPM is listening on a Unix socket instead of a TCP/IP socket, which is good. Save and close the file. Reload PHP-FPM for the changes to take effect. By default, the Nginx package on RHEL 8/CentOS 8 includes configurations for PHP-FPM (/etc/nginx/conf.d/php-fpm.conf and /etc/nginx/default.d/php.conf). To test PHP-FPM with Nginx Web server, we need to create a info.php file in the document root directory. Paste the following PHP code into the file. Save and close the file. If you installed LEMP stack on a local RHEL 8/CentOS 8 server, type in 127.0.0.1/info.php or localhost/info.php in the browser address bar. You should see your server’s PHP information. This means PHP scripts can run properly with Nginx web server. If RHEL 8/CentOS is running on a remote server, then enter server-ip-address/info.php in browser address bar. 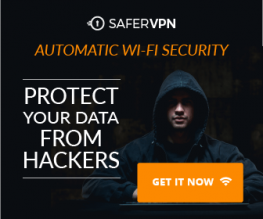 Replace sever-ip-address with your actual IP address. Congrats! 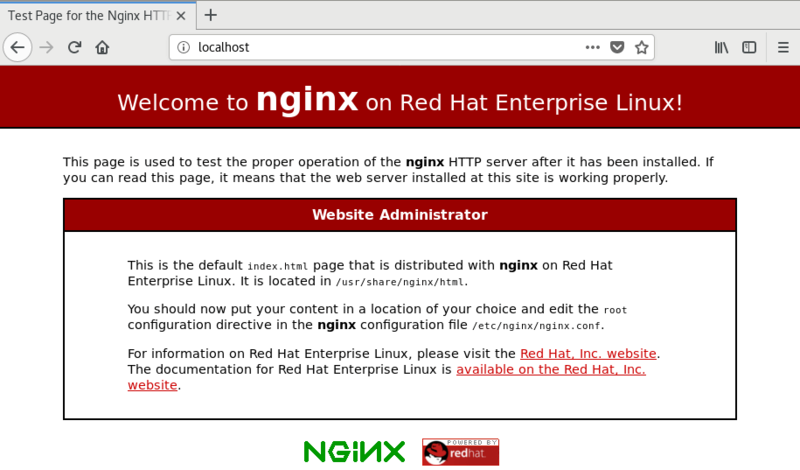 You have successfully installed Nginx, MariaDB and PHP7.2 on Red Hat 8 or CentOS 8. For your server’s security, you should delete info.php file now to prevent hacker seeing it.